The Fastest, Most Painless Way To Improve Your Body!! 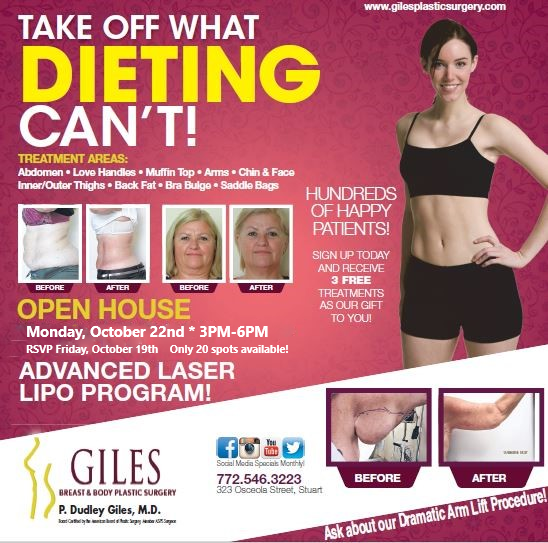 Giles Breast & Body Plastic Surgery Invites You To Come Learn More About Advanced Laser Lipo Body Sculpting Options! 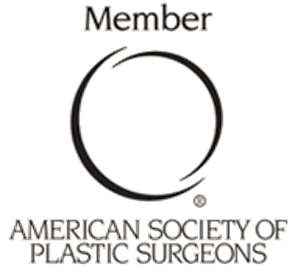 Why Trust Anyone But A Plastic Surgeon For Your Body Sculpting Needs? Come Join Us For Our SculpSure Body Contouring Open House! Monday March 11th, 2019 9:00 A.M. – 4:00 P.M.
SculpSure is Non-Invasive Laser Body Contouring that Helps You Achieve a Natural-Looking, Slimmer Appearance! Why Trust Anyone But A Plastic Surgeon For Your Body Contouring Needs? 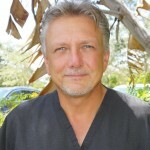 Call (772) 546-3223 to RSVP or Schedule Your Complimentary Consultation! SculpSure helps you safely reduce stubborn fat in problem areas such as the belly, love handles, arms, back and thighs. Take Off What Dieting Can’t! 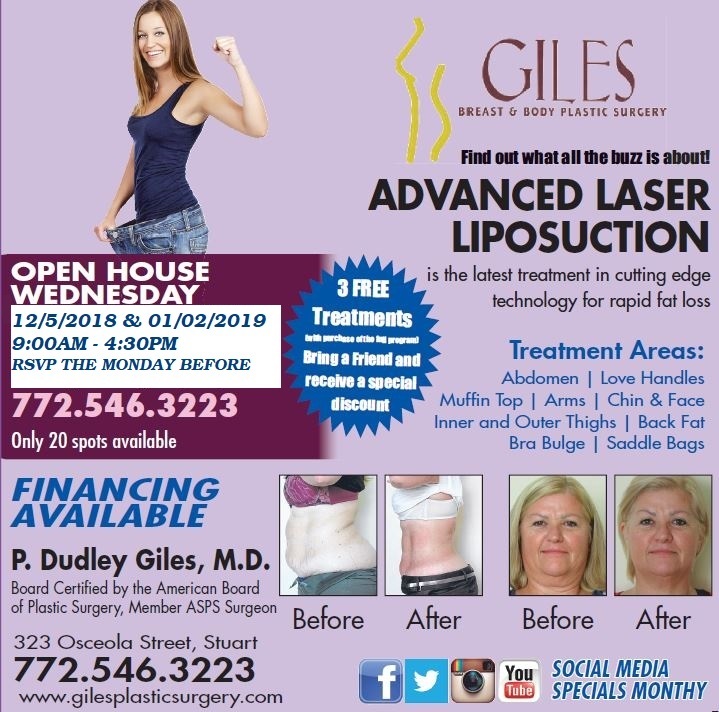 Thursday November 15th, 2018 5:00 – 7:00 P.M.
Giles Breast & Body Plastic Surgery Invites You To Come Learn More About SculpSure Body Contouring and Fat Reduction Options! 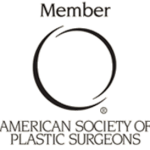 Why Trust Anyone But A Plastic Surgeon For Your Body Shaping Needs? 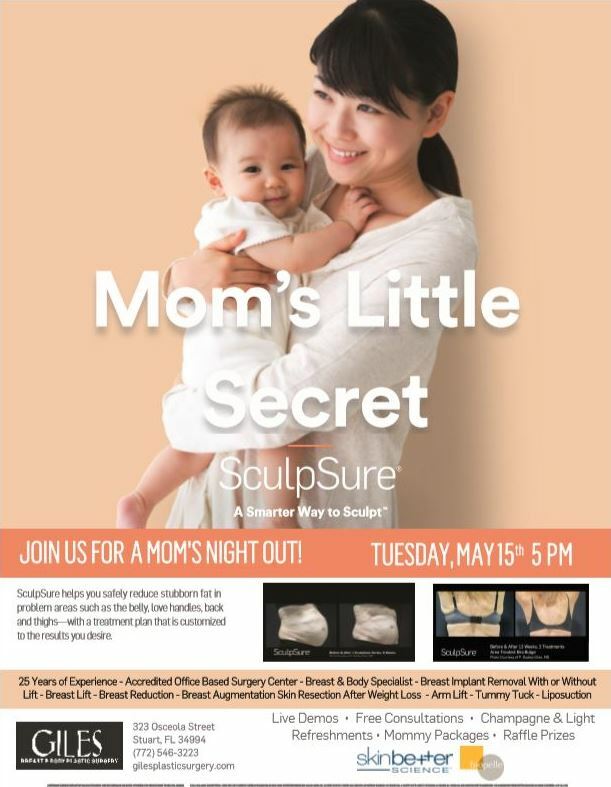 Come Join Us For Mom’s Night Out May 15th, 2018! 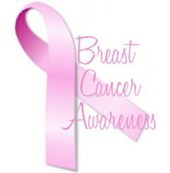 Live Demos · Free Consultations · Champagne & Light Refreshments · Mommy Packages · Raffle Prizes and more! 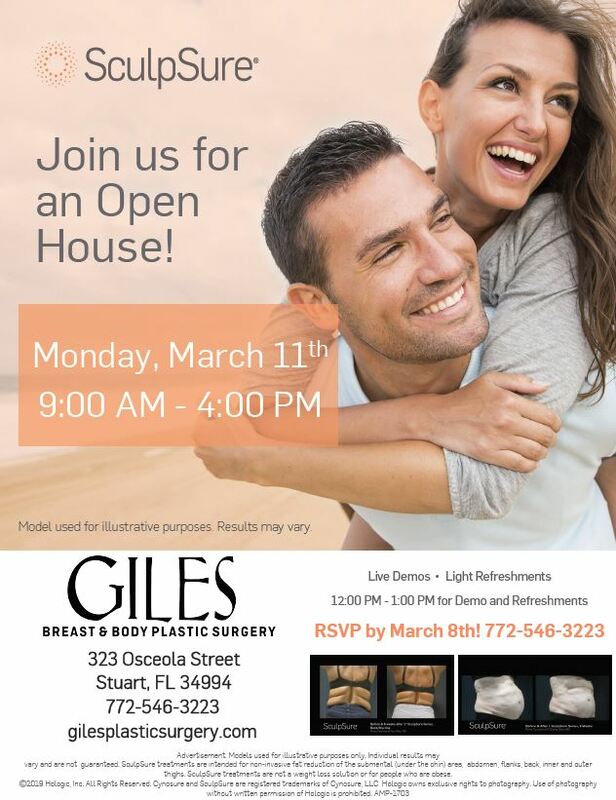 Giles Breast & Body Plastic Surgery Invites You To Come Learn More About SculpSure Body Contouring and Fat Reduction Options! We Want You To Love Your Curves! Join Us for a SculpSure Body Contouring Consultation Event on Wednesday March 14, 2018 from 8AM to 5PM. 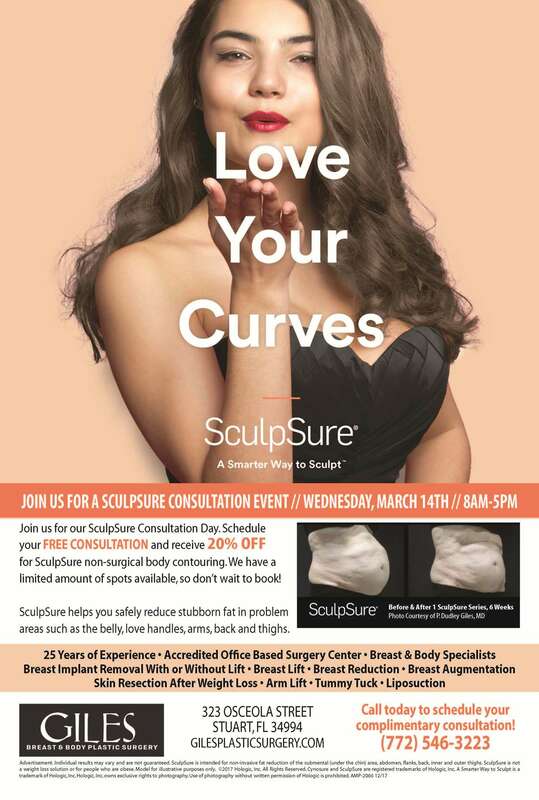 Join us Wednesday March 14, 2018 for SculpSure Consultation Day! Schedule your complimentary consultation and receive 20% off SculpSure non-surgical body contouring! Space in limited, so don’t wait to book! 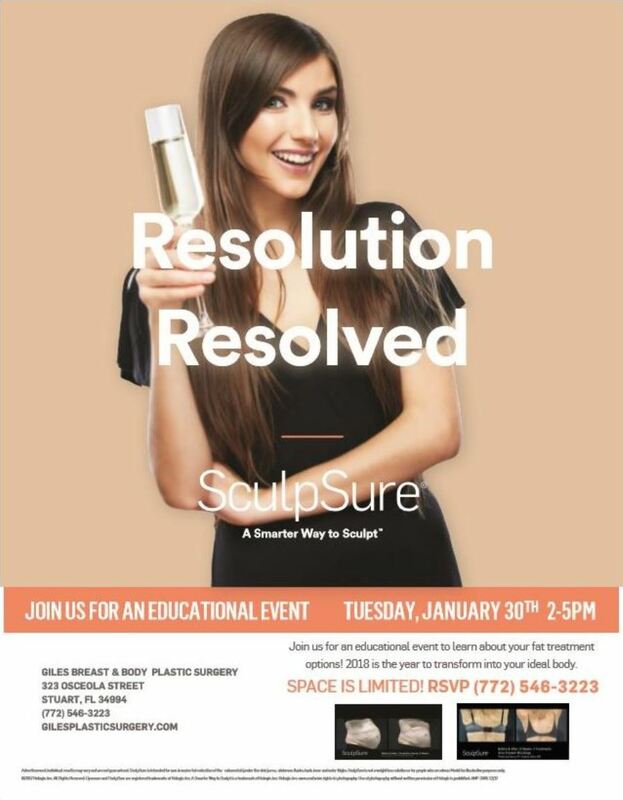 Giles Breast and Body Plastic Surgery Invites You To Come Learn More About SculpSure Body Contouring and Fat Reduction Options! 2018 is the Year to Transform Into Your Ideal Body! Join us Thursday, November 2nd for an Exclusive Event! Come learn more about SculpSure non-invasive body contouring at our exclusive event November 2nd, 2017. SculpSure is the non-surgical body sculpting treatment as flexible as you are! 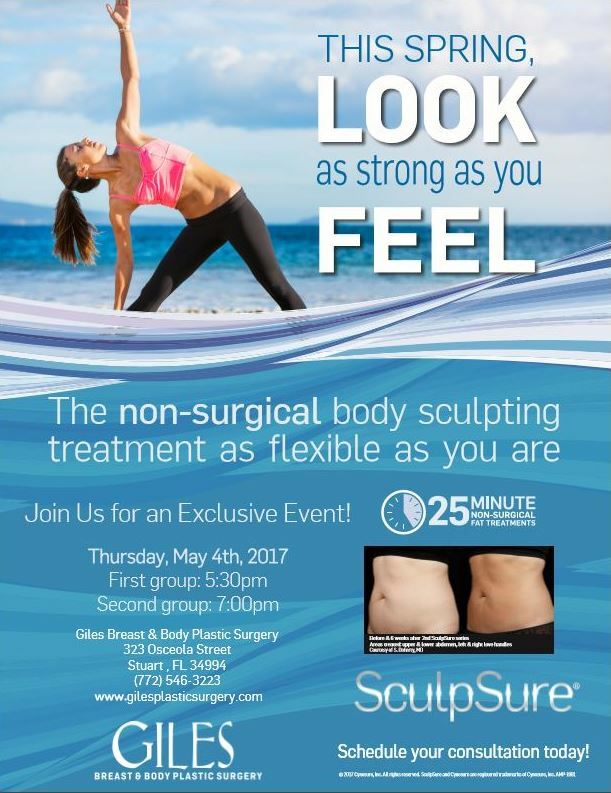 Come learn more about SculpSure non-invasive body contouring at our exclusive event Thursday May 4th, 2017. SculpSure is the non-surgical body sculpting treatment as flexible as you are!